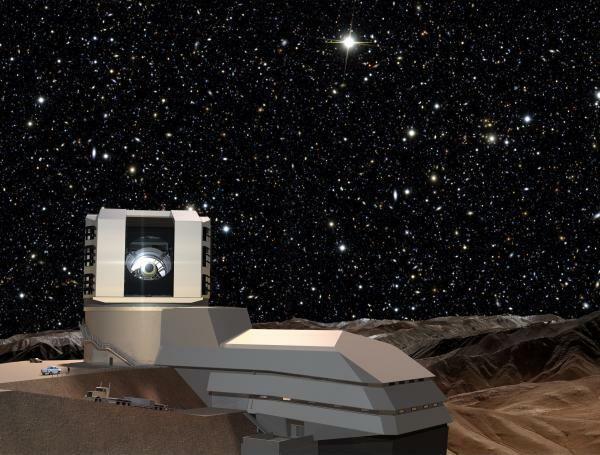 ...an 8-meter class ground based optical telescope with a 3.5 degree diameter field-of-view and a 3 billion pixel camera. It is designed to survey the entire visible sky every few nights with short repeated exposures. .. a data management system that will process, archive and distribute the survey data as well as associated transient alerts and generated catalogs. These data and data products will be provided to the public without any proprietary period. ...an ambitious education and public outreach program that will promote science, education, and research in classrooms as well as science centers. ...the highest priority large scale ground-based project recommended by the 2010 Decadal Survey. How is NOAO involved in LSST? Starting in the late 1990s, AURA and NOAO advocated for a wide field survey telescope. In 2003, NOAO became one of four Founding Partners of the LSST Corporation (LSSTC) along with the Research Corporation for Science Advancement, the University of Arizona, and the University of Washington. The NOAO Director is a standing member of the LSSTC Board of Directors and the AURA Management Council for LSST. In October 2011, the LSST Project became an AURA operating center, an agreement that brings together AURA’s long-term management experience with the substantial scientific and technical expertise developed by LSST Corporation over the past decade. During the design and development phase, NOAO provided significant funding to the LSST Telescope and Site Facilities team. During the current construction phase, that team is located within NOAO facilites in both Arizona and Chile. This part of the project includes all aspects of the telescope, site, summit facility and base facility except the equipment specific to the camera and the data management tasks. The team includes engineers, programmers, and scientists with a rich history of astronomical facility development, maintenance and operation to address the development challenges of this sub-system. Beyond the LSST Project itself, current NOAO activities related to LSST are focused on developing user research support infrastructure for big catalogs and time-domain characterization. This work is organized within an NOAO project team known as the LSST Community Science Center. Last updated or reviewed January 20, 2017.